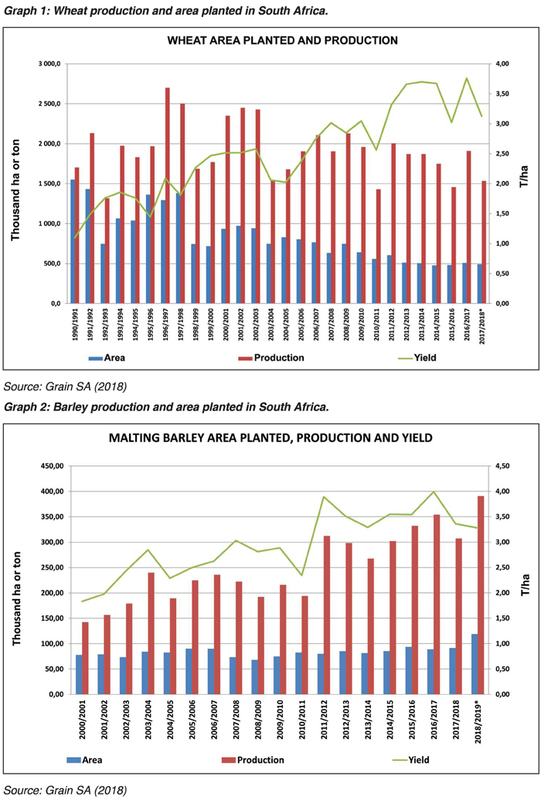 This article gives a brief overview of what the 2018/2019 marketing year looks like for wheat and barley, in terms of production, supply and demand. Over the years, the area planted under wheat has been on the decline due to decreasing profitability. Despite all that, the crop estimates show that area planted to wheat will increase from 491 600 ha in 2017/2018, to 508 350 in 2018/2019 (Graph 1). The expected commercial wheat production is about 1,808 million tons in the new season, with a yield of 3,363 t/ha. The expected production in the Western Cape is 890 400 tons, this is a 51,7% increase from the previous marketing year, with a marginal decline in production area from 326 000 ha to 318 000 ha. The Free State is showing an increase of 31% in hectares from 80 000 ha to 105 000 ha, with an expected production of 367 500 tons. The total supply of wheat is projected at 3 951 724 tons for the 2018/2019 marketing­ season, including opening stock levels of 731 624 tons on 1 October 2018, with local commercial deliveries of 1,81 million tons, whole wheat imports estimated at 1,4 million tons. The total demand for wheat is projected to remain consistent with the previous season, at 3,3 million tons. This includes 3,180 million tons processed for human consumption and 3 000 tons processed for animal consumption. A projected export quantity of 35 000 tons processed products and 80 000 tons whole wheat for the new season. The projected closing stock level at 30 September 2019 is estimated at 626 624 tons; with an average processed quantity of 265 250 tons per month, this represents available stock levels for 72 days. Compared to the previous marketing year, the area harvested is estimated to increase from 91 380 ha in 2017/2018 to 119 000 ha in 2018/2019 (Graph 2). Production is also expected to increase significantly from 307 000 ton to 390 840 tons in the new season, with a yield of 3,28 t/ha. Opening stocks as at 1 October 2018 was 199 000 tons, we expect about 19 000 tons less on 1 October 2019. Imports for the 2018/2019 marketing year are expected to drop to about zero compared to 13 000 tons the previous season. Regarding demand, the majority of malting barley is used for food in South Africa with a minor amount used for feed. Barley for food consumption is expected to increase in the 2018/2019 marketing year, from 300 000 tons to 333 000 tons, with feed barley up from 7 000 tons to 11 000 tons. Barley exports remain at zero with barley product exports expected to increase from 18 000 to 20 000 tons. Ending stocks are projected to decrease from 179 900 tons to 128 200 tons on 30 September 2019, which would be 86% above the pipeline requirements, covering 42 days.